When the Kaiser wished to ennoble a Hamburg merchant, his colleagues were puzzled as no noble had the status of Hamburg merchant, making ennoblement redundant. The Master and Upper Warden are involved in the hitherto annual Morgensprache of the Hamburg Chamber of Commerce, the ceremony by which a new Altermann is installed, modelled on the City of London’s Silent Ceremony. I got in first, choosing Hamburg as the destination for my Master’s weekend which, as a World Trader, is traditionally abroad. 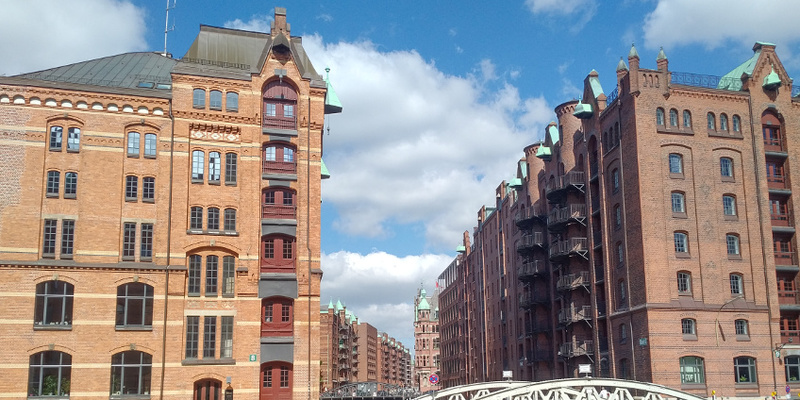 To discover Hamburg properly, we organised an excellent guide from Rosinenfischer, Maureen, who took us on a bus tour of the Town, trying to avoid the traffic jams caused by rehearsals for the upcoming G20 Summit. We got a good impression of the layout, but seemed to drive from one red light district to another, not stopping of course. We went down into the fascinating old Elbe Tunnel, to which vehicles descend in lifts. Then to the Baroque St Michael’s Church with its two organs and thousands of pipes. Wonder if Andrew Parmley ever played it! In the evening, the rain came down as we huddled under umbrellas waiting for our Alster dinner ship to arrive. The Treasurer ordered drinks for everyone so it was a fine bonding moment. Our resident World Trader, Herbert Noelting, came to our rescue. The ship’s boss, a delightful elderly woman, had forgotten that we had agreed to meet at the Atlantic pier. We then enjoyed a very pleasant trip along the river, through the canals with an excellent buffet and plenty of wine. Back to the Reichshof hotel (Hilton Curio Group) where next morning a Jasper Tours bus collected us for an amazing tour of one of the massive Container Terminals, where we had to follow security personnel everywhere. Huge vessels carrying thousands of containers each and amazing contraptions rushing everywhere to move them to where they must be collected within hours. Computer control has reduced the workforce to 20% of its previous size.. Lunch was in a private area of the Wasserschloss Restaurant in the Warehouse area from where Maureen collected us for a walking tour including the amazing architecture of the Spice House, and past the site of the original Hamburg fort. In the evening we met at the Parlament Restaurant, in the basement of the Rathaus (City and Parliament Hall) and despite guided tours being suspended because of the upcoming G20 Summit, an FDP MP, Michael Kruse with young colleagues took us to,the Chamber and some of the magnificent reception rooms with their painted histories of Hamburg’s Hanseatic past. A fine dinner at a long table which was walked off on our return to the hotel. More World Trading on the Saturday morning with an excellent presentation – attended by all! – by Michael Konow of the President’s Office of the Hamburg Chamber of Commerce, a venerable institution in the Centre of Town with a large building and its own training school for apprentices. The presentation is on the website. All Companies must by law be members of the German Chambers of Commerce, which play a much greater role in training and representation than our UK versions. Plenty of Q&A from World Traders. To the beautiful riverside premises of the Anglo German Club (still no women members, we were appalled to learn) for drinks and canapés, hosted by generous Club members. “We can’t comment on Brexit as it is your affair, but we would love the UK to change its mind”. We joined Maureen in Town, although several opted for a rest rather than join a fascinating tour which included old and modern buildings, coffee and cake in a working coffee roasting house, a carpet warehouse, a spice exhibition and then the amazing (and hugely over budget) Elbphilharmonie whose concerts sell out within minutes of bookings opening. Fortunately for exhausted legs, the farewell dinner was held at our hotel in a private room, after which some World Traders engaged in a pool contest until the small hours. Sunday morning we took the U Bahn to the Miniaturwunderland, the World’s largest and still expanding model railway exhibition, which includes a working airport and a model of an erupting Vesuvius. This is not just for older boys, everyone was impressed. A farewell brunch at the Schoenes Leben restaurant in the Warehouse Area (Speicherstadt) rounded off a memorable and varied few days. I can stop the Valium now!